Nine bottles never looked so good on a wall. The 3-foot Wall Series metal wine rack is the perfect intersection of form and function. It fits onto just about any wall, with ample height to fill open rooms with contemporary style while maximizing storage potential. 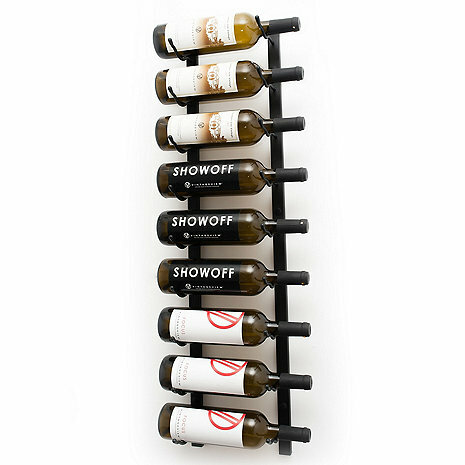 This metal wine rack shows off bottles label forward with VintageView's patented system. As with the entire Wall Series offerings, these racks are stackable, allowing multiple configurations for any wine room project. Constructed of high-quality steel with four finish options available, our racks are durable, easy to install, and great for both residential and commercial applications. This one bottle deep, nine-bottle VintageView rack allows you store wine in many areas that wood racking simply cannot accomodate. Available in black or platinum finish. Attractive, sturdy, easy installation of 5 rows to hold 45 bottles. Free shipping would have been nice. Found one bottle of red with an extra large heel which JUST fit into the rack. Otherwise, everything fits securely; including whites. Installation is not a problem. I recommend you be very careful marking the hole locations ensuring they are perfectly horizontal (and vertical if installing multiple racks side-by-side). I drilled 1/4" holes for the supplied drywall plugs to ensure they screwed in perfectly horizontal.